After nearly wiping out many wildlife species 50 years ago, Americans are once again living close – sometimes uncomfortably so – to all kinds of feral creatures. Why wildlife in the U.S. needs stronger management. Faced with an outbreak of lyme disease and rising deer-related car accidents, the city council of Durham, N.C., authorized bow hunting inside city limits in November. Authorities in San Jose, ­Calif., in the heart of Silicon Valley, voted to allow hunting wild pigs within that city in October. Rock Island, Ill., one of the five Quad Cities on the Mississippi River, recently approved bow hunting in town, provided that it occurs in green spaces—golf courses, parks, cemeteries—or on private land. In Maine, new rules doubled the number of birds that wild-turkey hunters can take home this year and gave them an extra 30 minutes before sunrise and another 30 minutes after sunset to bag them. Ohio granted its deer hunters a similar overtime, stretching the hunting day into darkness. And in New Jersey, despite protests and a spirited lawsuit, the fourth annual black-bear hunt will start bright and early on Monday, Dec. 9. A small army of hunters, their names chosen by lottery, will begin combing the forests between Philadelphia and New York City in a six-day season designed to cope with what has become a bear boom of unsustainable proportions. Across the country, hunting is poised for a comeback, and not just because the folks on Duck Dynasty make it look like so much fun. We have too many wild ­animals — from swine to swans. ­Thirty million strong and growing, the population of white-tailed deer in the U.S. is larger today than it was when ­Columbus sailed the ocean blue, according to National Wildlife Research Center scientist Kurt VerCauteren. 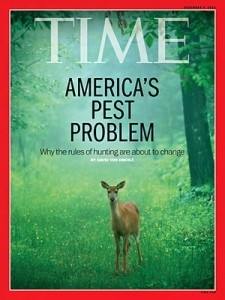 The deer gobble up crops and vegetable gardens, dart into traffic and spread tick-borne diseases. Then there are the wild hogs. From a little herd imported to feed explorer Hernando de Soto’s 16th century expedition, some 5 million feral pigs are rooting through city parks and private lawns in 48 of the 50 states. And beavers. Nearly wiped out in the 19th century, they’re back with a vengeance. In the Seattle suburb of Redmond, beavers are felling ornamental trees not far from Microsoft head­quarters to build dams in the drainage culverts. Bald eagles are back too; one has been feasting on pet dogs near Saginaw, Mich. Raccoons bedevil the tony North Shore suburbs of Chicago. The world’s largest Burmese pythons are no longer found in Burma; they are flourishing in South Florida. Wild turkeys swagger through Staten Island, N.Y. The yip of coyotes competes with the blare of taxi horns in New York City and Washington, while a fox has lately been in residence on the White House grounds. At least one mountain lion has had its photo snapped while hanging out in the Holly­wood Hills. On Nov. 20, a conservation officer shot a wildcat hiding in a concrete tunnel under a corncrib in northwestern Illinois, far from the nearest established breeding population, in South Dakota. The article is partially locked behind a subscriber wall ….